Cooperation and conflict – Page 2 – Patrick F. Clarkin, Ph.D.
A few years ago, David Yanagizawa-Drott of Harvard’s Kennedy School of Government examined the effects of radio propaganda on the 1994 Rwandan genocide, which led to the deaths of 0.5 to 1.0 million people (Yanagizawa-Drott, 2014). 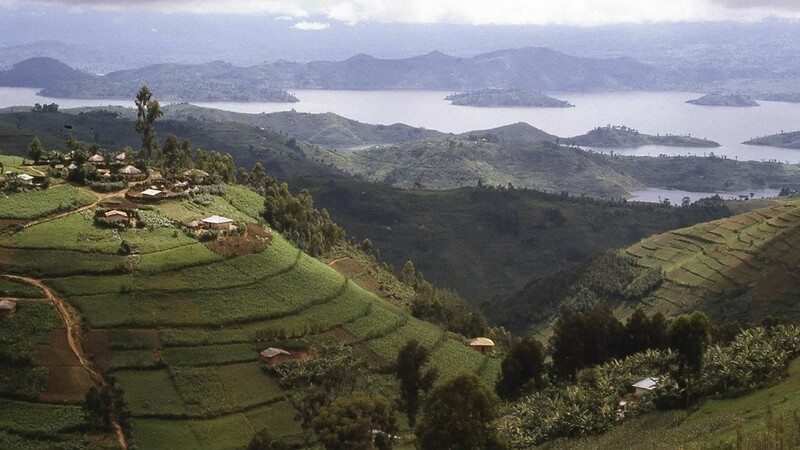 Rwanda is sometimes called “The Land of a Thousand Hills,” and given the effects of uneven topography on radio transmission, he reasoned that villages with better reception would have been exposed more to incitement to violence against the Tutsi minority. In particular, the Hutu-controlled radio station Radio Télévision Libre des Mille Collines (RTLM) was infamous for dehumanizing the Tutsi by calling them “cockroaches” and calling for their extermination. Yanagizawa-Drott noted that others had pointed to the role of RTLM and other mass media in fomenting hatred in Rwanda, but no one had attempted to quantify the effect. 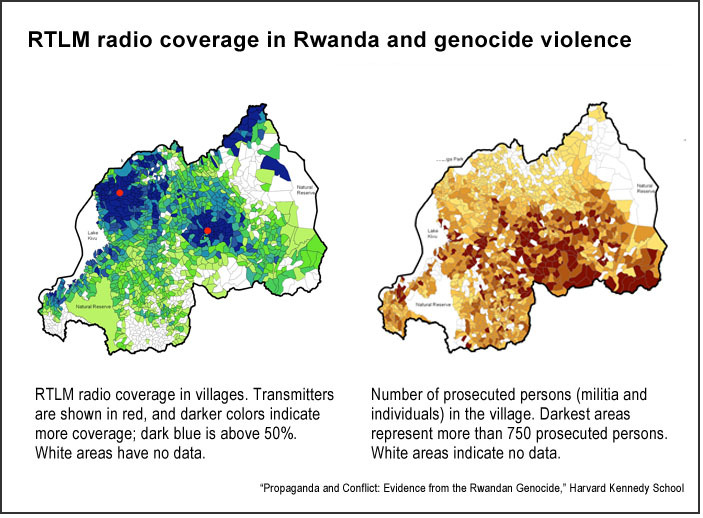 He calculated the area with radio reception within each village and then correlated it with number of persons prosecuted for violent crimes committed during the genocide in each village, including as a member of a militia (n = 77,000) or as an individual (n = 432,000). He found that “a one standard deviation increase in radio coverage is associated with a 12–13 percent increase in participation in total violence. The effect is similar for militia violence (13–14 percent) and individual violence (10–11 percent).” Furthermore, there was a “spillover effect,” where the number of people engaged in militia violence increased significantly when neighboring villages had radio coverage. Overall, he estimated that nearly one-third of the violence perpetrated by militias could be attributed to the broadcasts. Dragon’s blood tree on the island of Socotra, Yemen. Source. I sometimes wish we could fast-forward through this messy period of human history. I imagine that our descendants will be embarrassed by how sectarian and insular we were. It will probably take generations, but it seems almost inevitable that the world will keep shrinking until it becomes the prevailing wisdom that all people share a common ancestry and that our commonalities outweigh our differences. Yet, here we are. Ethno-nationalism is on the rise in Europe, with many people increasingly angered by the influx of Muslim refugees. In the United States, I.C.E. is rounding up and deporting people who have lived here for decades and who pose a threat to no one, including military veterans, a doctor, a mother of four children, and a college professor. President Trump infamously referred to several countries — including El Salvador, Haiti, and all of Africa — as “shitholes, and implied that people from those places should not be allowed to immigrate to the U.S. Left unspoken, this presumes that a country’s political or economic struggles are a reflection of the character of all of the people who live there. At the time, there was one resettled family from Syria — a young couple and their three beautiful young children. The calculated wielding of fear as a weapon against five harmless human beings struck many people, including me, as cynical and reprehensible. I just saw this video (below) yesterday. It shows Roy Moore, who is currently running for Senator for Alabama, commenting on evolution. Apparently, it dates to 1997, and in it Moore criticized evolutionary biology for the things it allegedly could not explain, such as why mammals, reptiles, and bird all had males and females (it can, in fact, explain this), and that there was no evidence that our ancestors evolved from animals that once lived in the water (there is). The idea that learning about evolution is responsible for society’s ills has a history. As I’ve written before, I think this view is profoundly misguided for a couple of reasons. For one, it is obvious that the human capacity for violence and callousness existed long before evolutionary thinking. The world before Darwin was not a paradise that was ruined by the idea that our species has changed over time or that we are connected to the rest of the natural world. This is an atypically short post. I don’t have anything to add. Please just listen. Ain’t no tongue can tell. And they fall to the floor.